Evidence has been growing for a number of years pointing to the array of health and social benefits to be derived from contact with the natural world for all ages1. However, results from a new YouGov poll, commissioned by The Wildlife Trusts, highlight the discrepancy between what parents think is best for children and what they actually experience. The Wildlife Trusts, who reach around half a million children each year through their junior membership and work with schools, are concerned about a loss of contact with wildlife during childhood. Despite the fundamental importance of nature to childhood the signs are that a generation of children is growing up at arm’s-length from the natural world. Children’s freedom to roam and time spent outdoors has shrunk, and with it their opportunities to discover wildlife, with just one in ten ever playing in wild places. 71% of children have never seen a lizard in the wild in the UK, more than half (53%) have never seen a flock of starlings and more than a third (37%) have never seen a hedgehog. But there were some positive signs – 95% of children had visited a park with a parent or guardian, showing the importance of everyday places for experiencing wildlife. Lucy McRobert, The Wildlife Trusts’ Nature Matters campaign manager, said: “We know that first-hand contact with nature is good for children. It makes them happier, healthier and more creative and for some it can have a life-changing impact. But there’s a gap between what society intuitively knows is best for children and what they’re actually getting. The results of our poll illustrate that some children are missing out on the contact with nature their parents and grandparents are likely to have known. This is partly due to the changes in our everyday lives and partly due to diminishing opportunities: wild places are vanishing and wild animals such as starlings and hedgehogs have declined massively over the past 50 years. More encouragingly, 95% of the children polled have visited a park with their parent/guardian or grandparent, and many (82%) had held a ladybird, highlighting the importance of using urban environments like parks and gardens as places where children can discover and experience wildlife. In a bid to ensure every child in the UK has an opportunity to enjoy regular contact with nature, over the next year The Wildlife Trusts are inviting individuals, parents, teachers, schools and organisations to share their ideas on what needs to happen to put the wild back into childhood and make ‘every child wild’ as part of a new initiative called Every Child Wild. Experience nature with your Wildlife Trust and take your child(ren) to one of our events, nature reserves, Wildlife Watch groups or join as a family. Join in the discussion with Every Child Wild and share your ideas and inspiration for reconnecting children with nature using #EveryChildWild on twitter, facebook and instagram. 1Health and social benefits derived from contact with the natural world for all ages. Experiencing nature in the short- and long-term has a significant impact upon heart rate and blood pressure (Pretty, 2005) up to 90% of the human requirement for vitamin D comes from the sun (Hollick, 2004). Nature makes us healthier; improves our mood; and increases our self-esteem (Barton & Pretty, 2010). Wells (2000) demonstrated that when low-income urban families were relocated to houses with nature nearby they had higher levels of cognitive functioning and a greater ability to direct their attention. On the whole, children with easy access to nature are more able to cope with stressful life than those in urban habitats lacking green space (Wells, 2003). In urban neighbourhoods, communities with access to more natural environments tend to function better; using data from over 10,000 people, White et al. (2013) found that on average both lower mental distress and higher wellbeing were linked with living in urban areas that possessed more green areas. People living near quality green space were twice as likely to report low psychological distress as those living near low quality open spaces (Maller, 2002; Nisbet, 2011). Access to nature can also aid recovery from illness (Kaplan, 2001; Maller, 2006). Arguably, if every household in England were provided with good access to quality green space, it could save an estimated £2.1 billion in healthcare costs (Natural England, 2009). In 2009, Natural England postulated that for every £1 spent on establishing healthy walking schemes the NHS could save £7.18 from the cost of treating conditions such as heart disease, stroke and diabetes. In the last four generations, children have become increasingly, arguably dangerously, disconnected from nature. The rise of ‘screen time’ (in Britain 11–15-year-olds spend 7.5 hours a day in front of a screen[i]) and the increase in the amount of time children spend indoors go hand-in-hand with a fear of strangers and a rise in traffic. Motor vehicle traffic in Great Britain increased by 2.4% between 2013 and 2014 - the largest increase since 2002. [ii] Since the 1970s, how far children can explore unsupervised has declined by 90%. [iii] More shocking to many parents who grew up rampaging unsupervised around the country are how children seem to be missing out on simple childhood pleasures: a quarter of children have never built a sandcastle and a third of children have never climbed a tree. All figures, unless otherwise stated, are from YouGov Plc. Total sample size was 4,224 adults, of which 1,070 were parents of children aged 18 or under. Fieldwork was undertaken between 16-20 Oct 2015. The survey was carried out online. The figures have been weighted and are representative of all GB adults (aged 18+). Total sample size was 1,082 children. Fieldwork was undertaken between 16 - 20 October 2015. The survey was carried out online. The figures have been weighted and are representative of all GB children (aged 8-15). Every Child Wild is part of The Wildlife Trusts’ wider My Wild Life campaign to communicate what nature means to people and its value to society. It aims to highlight both how disconnected UK children are from nature, and work The Wildlife Trusts are doing to reverse this. The Wildlife Trusts are the UK’s largest provider of children’s nature clubs overseeing more than 240 regular clubs: there are over 3,000 visits to our Wildlife Watch groups every year, totalling over 10,000 children. We employ over 400 members of staff to deliver our education work, helped by around 1,500 volunteers. Wildlife Watch is the junior branch of The Wildlife Trusts and the UK’s leading environmental action club for kids. There are 150,000 Wildlife Watch members around the UK (and the Isle of Man and Alderney too) and hundreds of local Watch groups where young people get stuck into environmental activities. Wildlife Watch members receive an exciting membership pack. We also have a wild website and a monthly e-newsletter full of wild ideas and nature-spotting tips. Helping children to experience and learn about nature has been at the heart of what The Wildlife Trusts do for more than 50 years. Each year The Wildlife Trusts run approximately 11,000 events across the UK, inviting families to have fun outdoors and get up close to wildlife. By bringing families together in activities we make it easy for everyone to get that daily dose of nature, and inspire parents to make room for wildlife in their children’s lives more regularly. The Wildlife Trusts are the UK’s largest provider of children’s nature clubs overseeing more than 240. We run Nature Tots sessions, a Forest School programme developed for pre-school age children, providing a wonderful opportunity to experience and learn from nature. The sessions encourage independent learning and team work, problem solving, physical development and creativity. This is child-led learning and the role of accompanying adults is to help children to undertake as much of the task at hand as possible. The Wildlife Trusts also reach huge numbers of children through working with primary and secondary schools, providing resources for teachers to use in their own teaching. 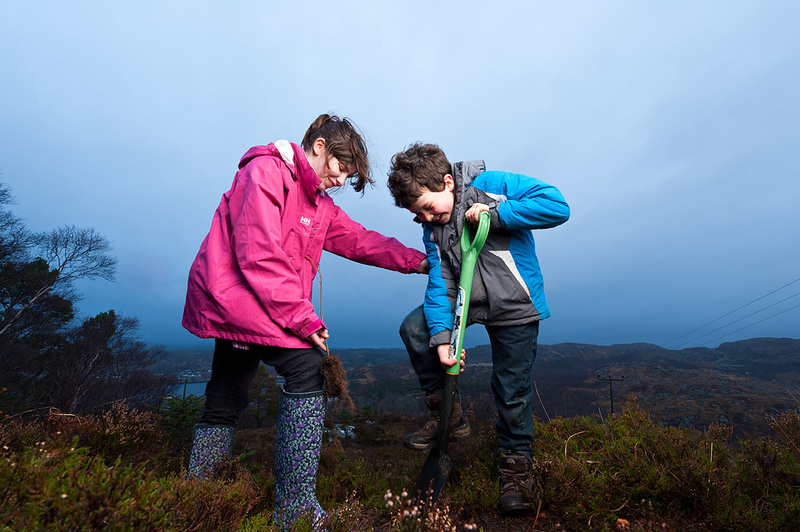 We host hundreds of school visits on nature reserves and deliver a range of activities. We love wild play. We’ve got sand pits, mud kitchens, outdoor gyms and even hire-able nature packs at many of our nature reserves to encourage young minds to explore, create and discover. Have fun and learn at our nature reserves where it’s always okay to play!